43 College Square - Older than it Looks! 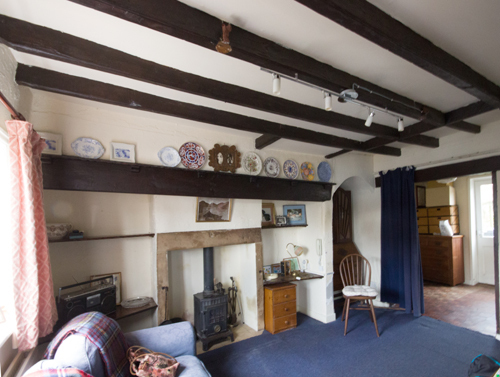 Above left: The front room of number 43 with its beaded ceiling beams running front to back. The much heavier wooden beam running at a lower level and enclosing the inglenook fireplace is known as a "bressumer". The arch to the right of the fireplace has been interpreted as the previous entrance to the house possibly via a front to back passageway such as still exists on the south side of the cottage. There is a slight difference in floor levels where the blue curtain acts as a screen dividing the front room from the rear, and it seems likely that the arch originally gave access to an internal passageway running across the house, but that the partition wall on the near side of the arch was later taken down. A modern plate rack runs along the line of the bressumer and above that to the right hand side are two short timbers that were placed to support a fire place in the room above. All of this suggests that despite the Georgian 'feel' of the front view of the cottage, it is actually of 17th Century origin. Above right: 43 College Square in context - with the edge of the 3-storeyed stone house visible to the left, 4 cottages in a row and another larger house at the right. 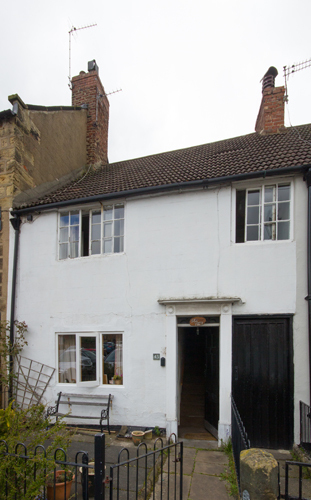 The rendering to 43 and 45 make it impossible to be totally certain, but there is a regularity about the sizes and positions of the windows and entrances which makes it appear likely that this entire row was rebuilt at the same time - perhaps as two pairs of cottages, each pair of which shares and is separated by a front to back passageway. 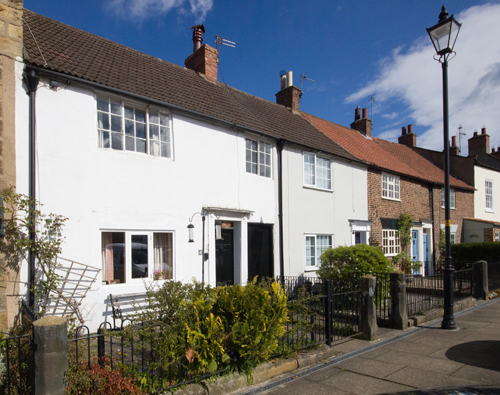 The visible brickwork is of stretcher bond, an early technique, and brick fan lintels, also an early feature, are visible above the ground floor windows of the right-hand pair of cottages. Left: A close-up of number 43. The rendering completely hides the brickwork but the Georgian appearance comes from the doorcase and door and the sliding wooden casements of the upper-floor windows. A closer look shows that the eaves reach the window-tops and hints at the contours of the ceilings within. The passageway to the right of the front door is divided from both houses by a pair of wrought iron railings, but the room above it is part of number 43. The passageway door is of distinctly 17th century style. Also of note is the chimney on the north (left) side of 43 which serves the main inglenook fireplace but is almost entirely enclosed by the stone house next door! See the Seaview Cottage Report. (By CLICKING on this link you can find a detailed technical report on the historical features of the cottage).